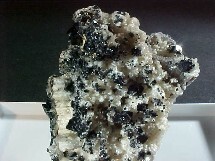 Shimmering black ilvaite crystals surround matrix. I'm not quite positive what the matrix is (quartz?). A very desirable miniature from the Kamioka Mine. 1-3/4" tall x 1-1/2". The image does not capture its true beauty. 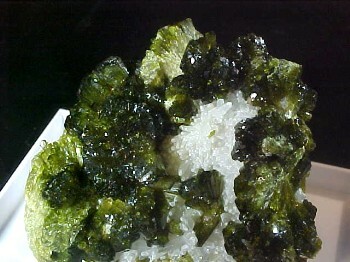 Wonderful, sparkling deep green epidote crystals on matrix. This is a very nice miniature from the Atlas Mts., Asif Melloul. 1-1/2" across x 1-1/4" tall. 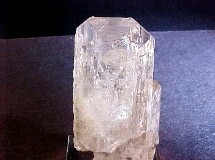 A terminated, transparant danburite crystal, with some calcite on the back. There is a smaller crystal attached to the side. A "glassy" miniature from Charcus, San Luis Potosi. 1-3/4" tall x 1" across. 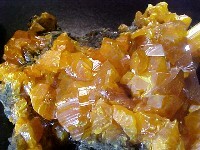 Orange orpiment crystals on matrix. Some of the crystals have transparancy. Orpiment is an arsenic trisulfide, and like realgar is unstable in light. 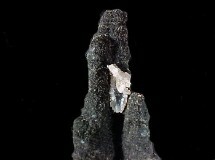 A small cabinet piece from the Twin Creeks Mine, Potosi Dist. 2-1/2" x 2". 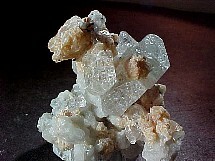 Several topaz crystals snuggled in albite and microcline. A dashing "perky" miniature. 1-1/2" tall x 1-1/4" across. From the Blue Sky Prospect comes these lustrous, velvet-like schorl crystals. Very attractive for the species. A miniature, 2-1/2" tall.